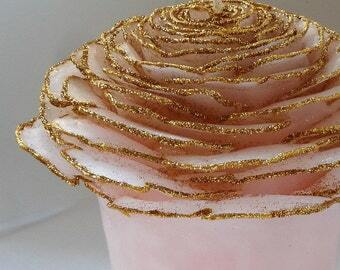 Romantic Wedding Unity Candle Set - handmade to order in 100% pure beeswax in your choice of natural white or natural honey color, adorned with air-dried rose petals and leaves. Choose the petal colors you want to coordinate with your wedding palette. 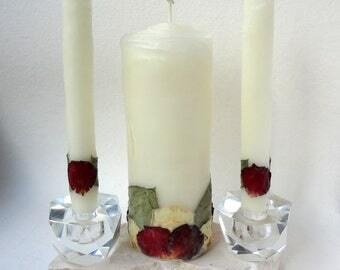 You can order the pillar by itself (use your own taper candles) or with matching tapers. 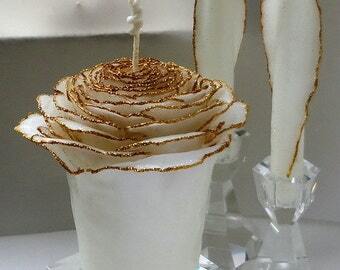 This listing is for one Rose Pillar & two Rose Tapers in my "Column" style (resembling roses just beginning to open) as shown in photos 1-5. Photo 8 shows my "Garden" style (with flared out edges resembling roses in full bloom) which are available in other listings in my Etsy shop. 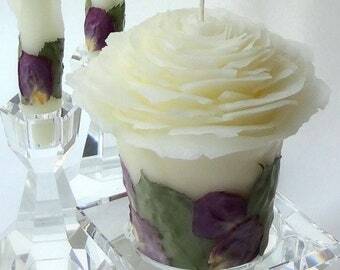 The candles are long burning, with a delicately fragrant natural honey aroma. 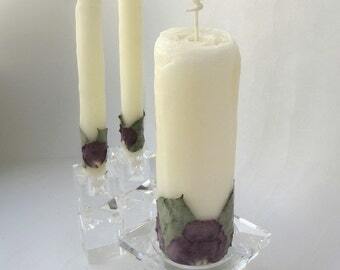 Handsculpted using my original designs & techniques, no two candles look exactly the same. 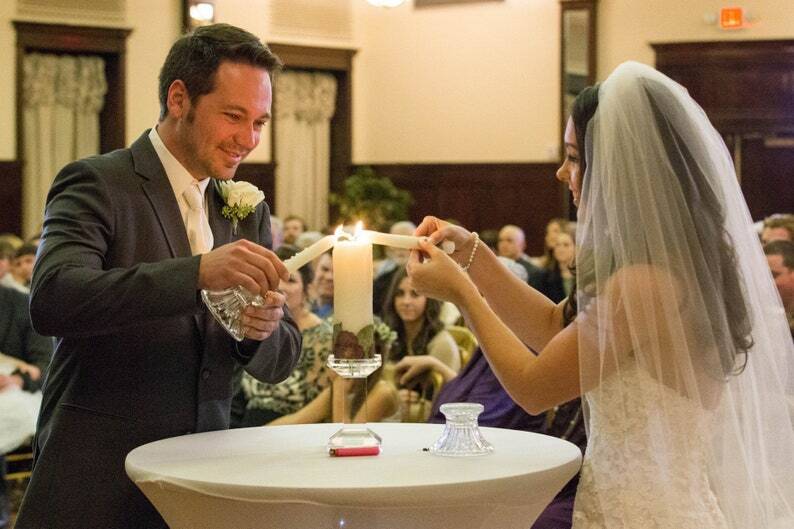 "I spent quite a while looking for unity candles for my wedding. Everything looked similar and a little corny or cheap. Once I came across these candles, I knew they were PERFECT for me. They came looking EXACTLY as they appear in the pictures, which is stunning!! Marcie is great communicating with you throughout the order process. My wedding planner had never seen anything like them and is going to refer her clients to Marcie as well. These can also be displayed year round. HIGHLY RECOMMEND!!!" Photos show examples of colors and styles from previous orders. 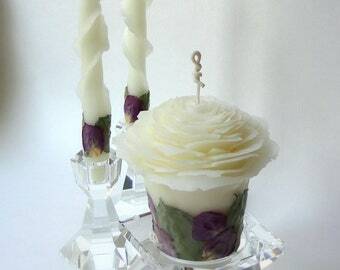 Your rose candles will be in my "Column" style (shown in photos 1-5). Candle colors shown are: natural white in photos 1-4, natural honey color in photo 5. Please tell me the wedding date & your need-by date in the note section during checkout. The current shipping fee & estimated production time for this item is listed in the "Shipping" section. Rates shown are California to East Coast. For a quote to your location contact me. Otherwise, I will refund any shipping fee overages to you via your original payment method.